Note: Inside the Image is a look into what went into making a specific photograph, it is something I started thinking about doing a couple of years ago but never got around to it. This is a way for me to give you a peak into what I see when I go out shooting B&W and will be a mix of photographic techniques, personal insights and the story behind the photograph. Every two or three years I take a trip to hang out with a fellow photographer and musician up north. I usually spend at least a couple of evenings shooting the bands he plays in. One night while shooting one of his bands I saw this lady in the bar and the unique blend of tattoos and Hello Kitty cowgirl t-shirt caught my eye. I wanted to photograph her but approaching people cold like that is not something I do. Plus I didn’t want to come across as a pervert with a camera hanging out in a bar. After talking to my friend who knew her and a couple of bottles of liquid courage I went up and asked if I could photograph her. I explained I liked the combination of tattoos and t-shirt and wanted to photograph them. She asked if I was going to include her face and I said no. She agreed and we walked over to the only area in the bar with light and I shot four images. This is the first image I shot. One of the reasons this image is a favorite is because the story it tells changes drastically between color and B&W. 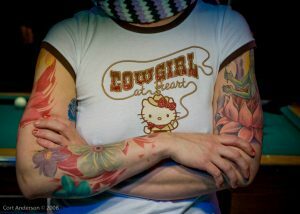 In color her tattoos take center stage and want to dominate the story. In B&W they step back and take a supporting role and the t-shirt subtly becomes the focus. In color your eyes stay on the tattoos and t-shirt. In B&W they start on the t-shirt then over to the tattoos and move on to take in the rest of the story. There is the scarf and the chipped fingernail polish along with the pool table in the background and other interesting details. It is a more subtle and interesting story. The technical specs are Canon 30D with a 50mm 1.8, 1/50 at f5.6 at ISO 1600. RAW file processed for color and density in Lightroom then into Photoshop for B&W conversion, contrast and density tweak and finally sharpening. I wanted some depth of field but not a lot and why I went with f/5.6, 1/50 is starting to push my limits for hand held. Coming from a newspaper background shooting primarily Tri-X I am not afraid of noise, then grain, and why I was comfortable with a high ISO. The light I found was at a pool table, the light was fairly soft and broad. Although it was low hanging it didn’t matter and was the perfect height to get fall off starting on top of her shoulders. If there is a photograph on my site you would like to know more about please leave a comment with the title and I will look at adding it to my Inside the Image list.